Bogra is known to be home to many archeological sites that indicate the existence of the most ancient civilisations in the South Asian region. Many inscriptions have been retrieved from these sites which would give us an idea of what these civilisations were really like. But these inscriptions that contain valuable information about our past remain a mystery because they have not been deciphered by experts. There are in fact, a large number of clay inscriptions in several store rooms waiting for many years, to be deciphered. Without archeological scholars to study them, these ancient scripts remain unfathomable remnants of the past. Md Abdul Khaleque, Regional Director (RD) Dhaka Division informs that the department had invited Dr. Bijoy Krishna Banik, a scholar, to decipher clay inscriptions which were found during archeological excavations in Paharpur, widely known as Sompur Buddhist Bihar in Naogaon district and Vasu Vhara in Bogra district along with other archeological sites in the country. Banik who is deputy keeper, Zainul Abedin Sangrahashala (Museum) in Mymensingh says that many clay seals have been kept in several store rooms of the department including Sompur Buddhist Bihar and Mahasthangarh museum. The Buddhist temple was built in 770 AD to 810 AD during king Dharmapala's reign in Paharpur in Naogoan, now a world heritage site. From 1922 to 1934, many archeological objects including clay inscriptions have been found in Sompur Buddhist Bihar site during archeological excavations. Md Mahbub-ul-Alam, Custodian, Paharpur Archeological Museum says that most of the clay inscriptions that are currently being displayed in the showcase of the museum have not been deciphered. The inscriptions were found near the existing temple and adjacent areas long ago during archeological excavations, says Mahbub-ul-Alam. 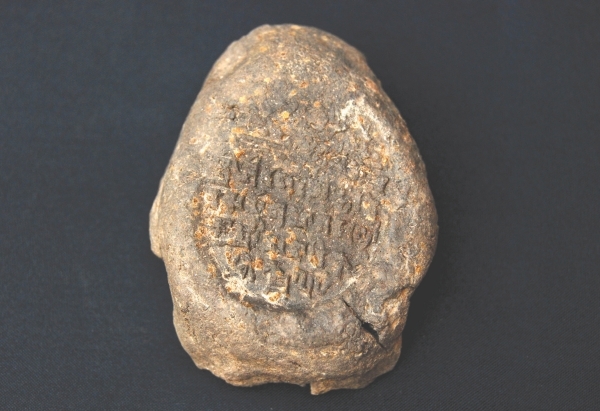 About two years ago, he adds, officials of the department found a part of a terracotta with two lines of inscription which is lying in the museum's store room, waiting to be decoded by experts. 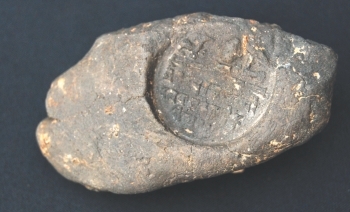 Huge clay seals with inscriptions along with other archeological objects were found at Vasu Bihar site in Bogra during excavations. A team headed by Dr Haroon-ur-Rashid, former head of Exploration and Excavation of the department excavated at Vasu Vhara site in 1973 for the first time and found huge seals, bronze images and other important archeological objects including decorated terracotta plaques. “Many clay seals with inscriptions have been found in the site during archeological excavations in 2008 and 2009 at Vasu Bihar site but most of them have become eroded and broken” says Naheed Sultana, Custodian, Mahasthangarh Archeological Museum. 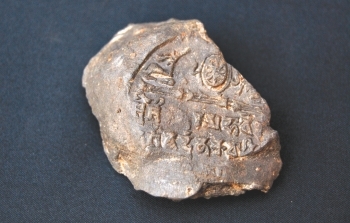 A clay inscription from Paharpur. According to documents, a Chinese traveller named Hiuen Tsang had visited the site in 639-645 AD and stayed there for about three months. During his stay he had visited many sites and wrote about his experiences travelling Bengal. He mentions in his accounts, that there were 700 Buddhist monks living in that area. “Ash, potshard and charcoal were found under the basement of the existing structure during an archeological excavation in the site” says Naheed Sultana. Some seals were found at Basu Vhara site carrying the symbol of deer and wheel which is known as “Dharmachakro” . “An unusual bird-like engraving was found at the site during excavation two years ago," says Md Mahbub-ul-Alam. Dr Banik, who is a former official of the department of archeology Bangladesh says that few inscriptions have been deciphered by some scholars in the country but to know more about the history of different archeological sites like Paharpur, Vasu Vhara, Mahasthangrah and others need further excavation and more scholars to decipher the ancient artifacts are needed. The writer is The Daily Star’s Bogra correspondent.